The designer's guide to taking back your profession. pick up the ebook versions! 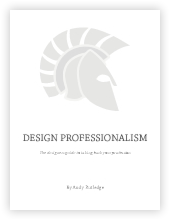 What is design professionalism and how does it fit into our daily work? Where do you start? How do you acquire the necessary education, ideals, and skills? How do professional ideals inform your career choices and impact your potential? How are practical matters affected by uncompromising professional standards? How do some common, seemingly compulsory activities impact your professionalism? How does this all create a cohesive set of mutually supportive standards & practices?